Google is going to be holding a press event 9 days from now and it looks like we might have some hint as to the news. 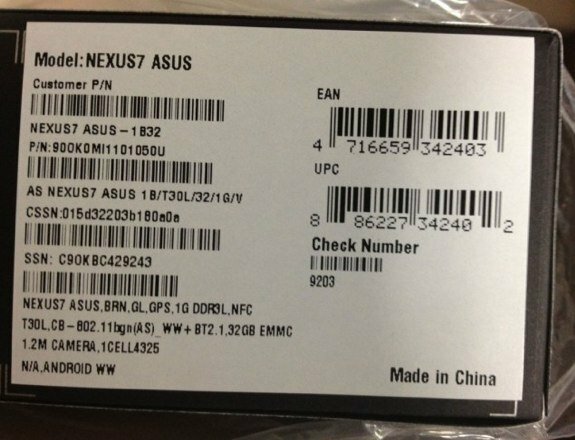 First, the long rumored and accidentally confirmed Nexus 7 Android tablet with 32GB storage has been confirmed for the US market. One Staples employee is reporting over on the Android Central forums that his store now has the new Nexus 7 in stock. It's reportedly going to go on the shelf on 29 October, the same day as Google's even in NYC. Retail will be $249, just like I expected, and that suggests that the 8GB model will be retired and the 16GB model will be sold for $199 - same price point as the Kindle Fire HD. But that's not Google's only tablet news. There is now confirmation from a couple different directions that Google has a Nexus 10 Android tablet in the works. An Italian gadget blog has turned up a 5MP image on Picasa which, according to the metadata, was taken by the Nexus 10 in South Korea. The photo is 5 days old, suggesting that someone at Google posted it to draw the attention of gadget blogs. The location data also lends credence to the rumor that the Nexus 10 was developed by Samsung, not Asus. And there is also apparently another image, taken with a different Nexus 10 in another Google office. Note that this is a trick they used back in June, before the nexus 7 was announced, and it certainly got my attention at the time. And it certainly worked now. And a couple Android blogs are reporting that the Nexus 10 is showing up in their server logs. According to Android Police, the Nexus 10 is running Android 4.2. They've seen a couple different build numbers for the OS, suggesting that it is still under development. It's my guess that Google plans to unveil both the new Nexus 7 as well as the Nexus 10 in NYC a week from Monday. I think the 2 photos would have only been posted right before the launch date; they're being used to build anticipation, so unless Google plans to release an even juicier detail at a later date the Nexus 10 will be revealed in 9 days. Hm, another Nexus tablet without any SD card slot? I will ask the same question when the Apple mini is released and whether I still need to use Itunes. But we already know iOS eschews SD cards — as webOS did. No SD with Android is an anomaly. Except iOS doesn’t eschew SD cards. You can get an adapter which takes them. But that adapter is fixed so that it will read only certain types of files and put them in certain places for access by certain apps. Good point, although I would argue that at the 32 gb juncture it is no longer an anomaly. Plus Amazon has conditioned us. If they are going to retire the 8gb, that would mean they will need to sell of existing inventory at below $199, so $175 would make sense. Google hands out gadget goody bags at Holidays in December usually anyway. They can dump several thousand by just handing them to employees. There is probably no huge need to do a fire sale if they have been managing the inventory of the 8GB for the last 3 months. If they knew they were going to switch then they should have been ramping down the last 1-2 months. They also could have used going international to flush units also. If Google has a huge backlog of unsold 8GB devices they have no clue what they are doing at all. Since the Nexus has no margin, deeply discounting means taking a loss in addition to negating demand for the newer models. I could see that if the product was old, but it came out in July. It would not be surprising if Google announced Android 4.2 “developers release” independently of releasing some new Nexus products with Android 4.1.2 . They may have coupled them but 4.1 just got released less than 4 months ago. The product cycles of moble market are fast, but that’s is pretty tight to get a phone all the way through vendor and cellular service vendor approval processes. A new Google Play store app doesn’t really need a new OS. Likewise with any other app/widget upgrade they might be doing. In the lead up to Google I/O 2012 in late June there were plenty of blogosphere stories about “Jelly Bean” Android 5.0 that was going to be announced at the conference. That ended up being “Jelly Bean” Android 4.1 . LG Nexus 4 and Nexus 10 with 4.2 could just as easily turn into LG Nexus 4 and Nexus 10 with 4.1.2 . Given 4.1’s Android market share is less than 5% ( was around 2% earilier in the month) doing another revision in less than 6 months is rather silly. The vast majority of the market just got to 4.0.4 (if eligible to upgrade). A small subset of the 4.0.4 is going to get to 4.1 by this December. To move the bar before that point in time again is just rather goofy. Google could announce a developers release that is targeted to January/February. This would be akin to Apple introducing iOS 6 at WWDC in June but it doesn’t appear in mainstream devices until September. The LG Nexus 4 and Nexus 10 could be the first ones to ge the 4.2 in rollout but releasing in November is a stretch. Google has thrown beta software at end users before, but they also announced at Google I/O in June that they would start more widespread developer releases of Android with a several month lead time before release to mainstream. Damn!! Say what? You need to write a blog.